Spinning is an important part of textile and apparel manufacturing industry. Textile spinning factories produce different types of yarn (carded yarn combed yarn) for the next process of textile such as weaving, knitting. 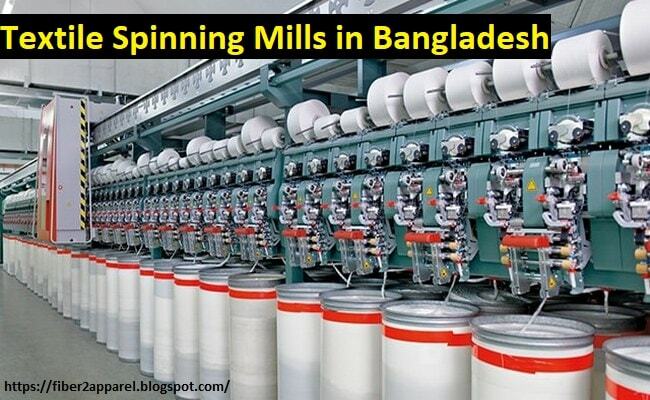 There are a lot of textiles spinning factory in Bangladesh. Among those, I have presented here a list of top fifty textile spinning factories which are synchronized here alphabetically. If you have any query about this list, please feedback in our comment box. Your advice, suggestions will be appreciated. 7. List of Top 20 Textile Industry in Bangladesh. 2. A.T & T Spinning Mills Ltd.
3. A.S.F. Fibre Mills Ltd.
4. AA Coarse Spun Ltd.
5. AA Synthetic Fibres Ltd.
6. Abdullah Spinning Mills Ltd.
7. Aegis Cotton Mills Ltd.
8. Afrin Spinning Mills Ltd.
9. Akij Textile Mills Ltd.
11. Aman Spinning Mills Ltd.
12. Amber Cotton Mills Ltd.
14. Baishakhi Spinning Mills Ltd.
15. Belkuchi Spinning Mills Ltd.
16. Bengal Synthetic Fibers Ltd.
18. Century Spinning Mills Ltd.
20. Comilla Spinning Mills Ltd.
22. Divine Spinning Mills Ltd.
23. Dulamia Cotton Spinning Mills Ltd.
26. H.R. Spinning Mills (Pvt) Ltd.
27. Ha-meem Spinning Mills Ltd.
28. Hongkong Shanghai Manjala Textiles Ltd.
36. Malek Spinning Mills Ltd.
37. Matin Spinning Mills Ltd.
40. Naquib Spinning Mills Ltd.
45. Pakiza Spinning Mills Ltd.
47. Prime Textile Spinning Mills Ltd.